MG5 revealed in official photos | What Car? 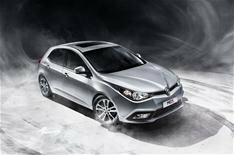 The MG5 has been revealed in official pictures 18 months ahead of its launch in the UK. Originally unveiled in concept car form at the 2011 Shanghai motor show, the MG5 will be launched in China soon, where it will be powered by a 1.9-litre petrol engine with around 105bhp. UK-bound versions will get a wider choice of engines, which should include at least one diesel unit. It has been suggested that a range of engines from 1.0- to 1.5-litres will be offered, with outputs of up to 162bhp. The MG5 is expected to be offered as a five-door hatchback only, and will be a rival for the Ford Focus and VW Golf. The MG5 will join the current MG6 and forthcoming MG3, which will be launched in late 2012.